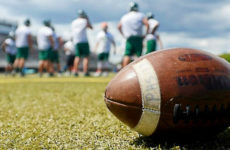 TORONTO – The Canadian Football League held its third and final regional combine today in Toronto, resulting in the four final players being invited to the National CFL Combine presented by Reebok in Toronto this coming weekend. 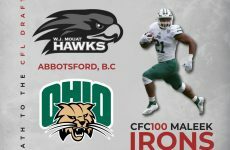 Players Raye Hartmann, Scott MacDonell, Aaron Milton and James Tuck were extended an invitation to display their athletic abilities once again in front of CFL scouts, coaches and management at the National CFL Combine in Toronto, beginning tomorrow and concluding Sunday March 23. Raye Hartmann a defensive back from St. Francis Xavier and a native of Mississauga, ON showed off his strength by completing 14 reps at the bench press drill (most reps among defensive backs). Hartmann also recorded the second farthest broad jump at the combine with a jump of 10’5.50″. Wide receiver, Scott MacDonell who is a native of Montreal, QC and played collegiately at Queen’s had 13 reps in the bench press drill (third among receivers) and recorded the second farthest broad jump among receivers with a jump spanning 9’9.00″. University of Toronto running back, Aaron Milton, a native of Whitby, ON showcased his skills in the 3-cone and short shuttle drills where he placed the best numbers among running backs. Milton in the 3-cone drill recorded 7.109s and in the short shuttle drill 4.265s. Defensive end, James Tuck from York University and native of Aurora, ON recorded the best numbers among defensive linemen in four drills including; 40-yard dash (4.875s), vertical jump (35.00″), broad jump (10’0.00″) and short shuttle (4.369s). Overall, 37 players attended today’s combine in Toronto and each athlete worked out in front of scouts from all CFL Teams. 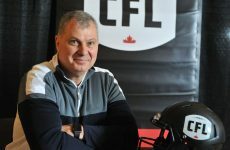 In total, after three Regional Combines, 14 players were extended an invitation to the National CFL Combine (five each from Edmonton, Montreal and four from Toronto). The 2014 CFL Combine presented by Reebok kicks off Friday afternoon with player arrivals, medicals and team interviews. On Saturday the players’ strength, athleticism and flexibility will be tested at the Park Hyatt Toronto Hotel. The camp finishes on the football field at Varsity Centre at the University of Toronto campus on Sunday. Stay tuned to CFL.ca for all your CFL Combine results and news. 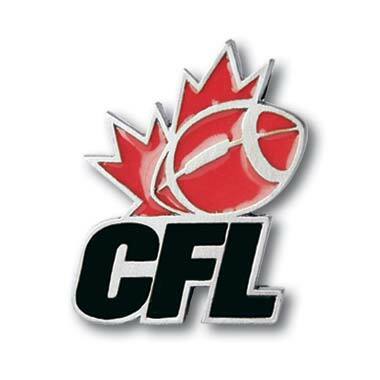 CFL.ca will be streaming live coverage from the 2014 CFL Combine, including the bench press drill, as well as the forty-yard dash. As it stands, there will be a total of 51 players invited to Toronto for the National CFL Combine.